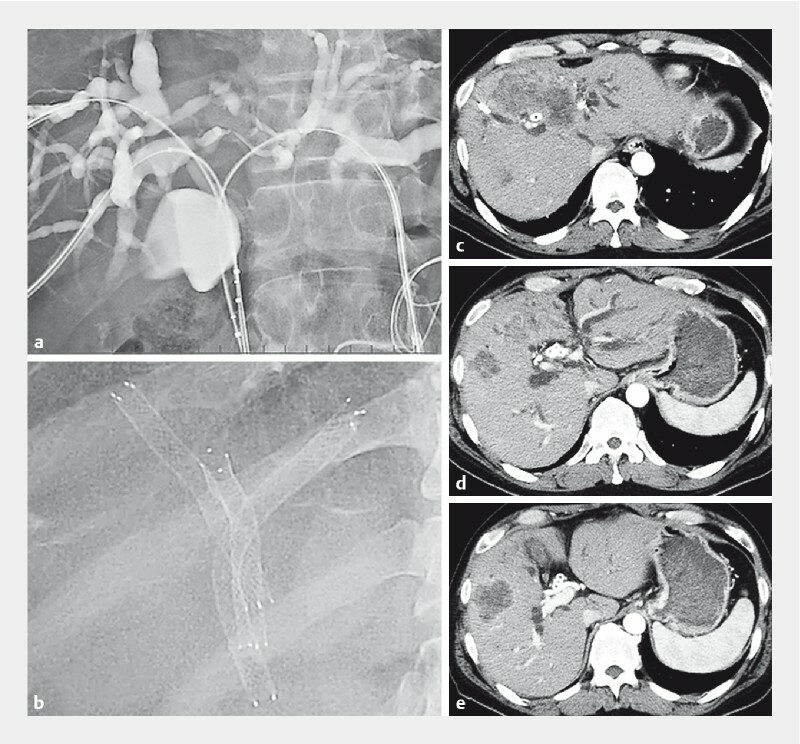 We present the case of a 46-year-old man who had undergone percutaneous side-by-side multi-stent drainage for hepatic hilar obstructive jaundice due to colorectal liver metastases ([Fig. 1]). Six months later, obstructive jaundice was again noted. Contrast-enhanced computed tomography (CT) revealed recurrent hilar obstruction due to tumor ingrowth into the stent. Fig. 1 Drainage for hepatic hilar obstruction. a,b Percutaneous side-by-side multi-stent drainage was performed. c The volume of the anterior liver segment was small because of liver metastases. d The left bile duct was dilated. e The posterior bile duct was also dilated. As there were multiple liver metastases in the right anterior section, we decided to drain the left lobe and posterior section only. We opted for endoscopic ultrasound (EUS)-guided drainage because we anticipated that re-intervention via a trans-papillary approach would be difficult after triple side-by-side stenting ([Fig. 1]). The EUS scope was inserted into the duodenal bulb where a dilated posterior branch (B6) could be identified ([Fig. 2]). The B6 branch was punctured using a 19-gauge needle, and a 0.025-inch guidewire was inserted after cholangiographic confirmation. Dilation of the tract was then performed using the ES-Dilator (Zeon Medical, Tokyo, Japan) and subsequently, an 8 mm × 6 cm fully covered self-expandable metal stent (SEMS-NIR stent; Olympus, Tokyo, Japan) was deployed. As the stent length at the duodenal side was slightly short, we inserted an additional stent of the same size into the existing stent. The EUS-guided hepaticoduodenostomy (HDS) was then complete ([Fig. 2], [Video 1]). Fig. 2 Endoscopic ultrasound (EUS)-guided hepaticoduodenostomy. a Posterior branch (B6) was clearly visualized by EUS from the duodenal bulb. b B6 was punctured using a 19-gauge needle. 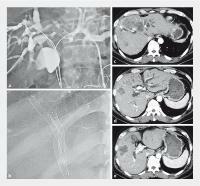 c Cholangiography revealed hilar obstruction. d An 8 mm × 6 cm fully covered self-expandable metal stent (NIR stent; Olympus, Tokyo, Japan) was deployed. Video 1 Simultaneous endoscopic ultrasound-guided hepaticoduodenostomy and hepaticogastrostomy. The EUS scope was then pulled back into the stomach where a hepaticogastrostomy (HGS) was performed to the B2 branch using a method similar to that described above ([Fig. 3]). [Fig. 4] shows the final fluoroscopic and CT images after simultaneous EUS-HDS and -HGS. There were no adverse events. Clinically, the total bilirubin level improved from 7.4 mg/dL to 0.9 mg/dL 14 days after the procedure. Chemotherapy was then restarted. Fig. 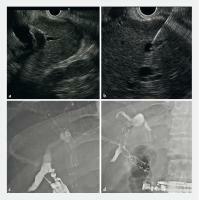 3 Endoscopic ultrasound-guided hepaticogastrostomy. a The dilated left bile duct (B2) was punctured using a 19-gauge needle. b A 0.025-inch guidewire was inserted after cholangiographic confirmation. Fig. 4 Final imaging studies after simultaneous endoscopic ultrasound (EUS)-guided hepaticoduodenostomy (HDS) and hepaticogastrostomy (HGS). a Fluoroscopic image. b Computed tomography (CT) of the EUS-HDS in the posterior segment. c CT of the EUS-HGS in the left lobe. 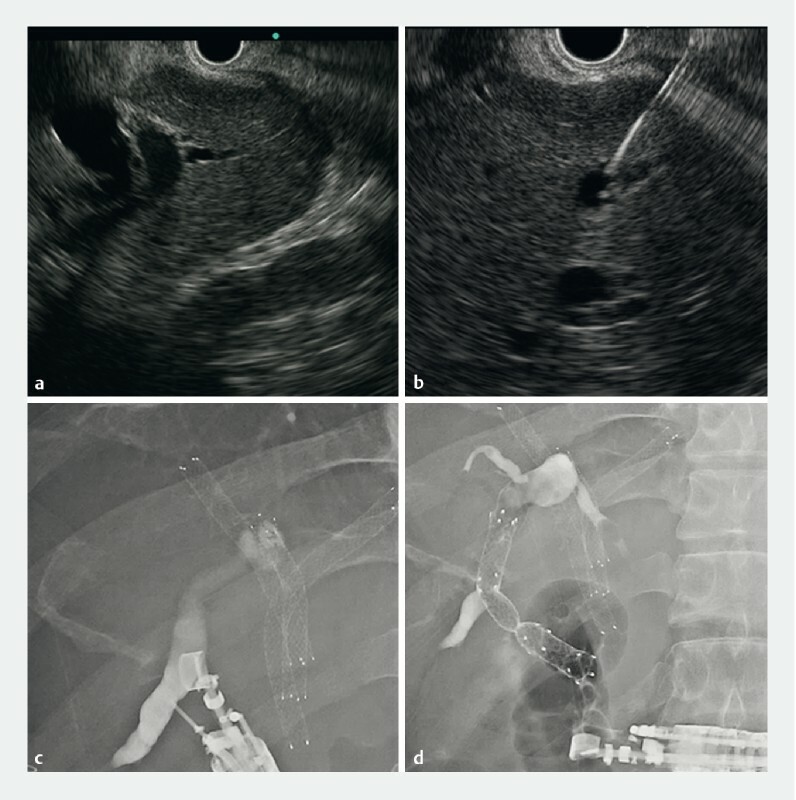 There are a few case reports of EUS-HDS in the literature    , but the current case is the first report of simultaneous left and right EUS drainage for hepatic hilar obstruction. It can be anticipated as a new drainage method.